70 join Minneapolis anti-war protest despite blizzard conditions | Fight Back! 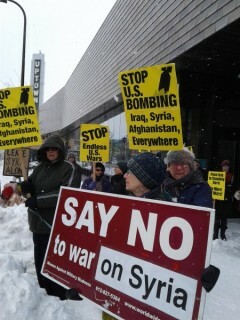 Minneapolis, MN - A Minneapolis protest on Sunday, April 15, called to coincide with national spring anti-war actions, brought out 70 people despite a heavy snow storm. Over a foot of snow had fallen in the hours before the scheduled protest in the Uptown neighborhood. Many streets had become impassable, and service on many city bus lines had been suspended. Organizers decided that with the U.S. bombing of Syria the day before, it was still important to have an anti-war statement. Plans were made to adjust the event to deal with the difficult weather environment. Despite the conditions, 70 people attended the protest. One person attending said that after the bombing Syria, "I had to be here." Among the speakers were Meredith Aby-Keirstead of the Anti-War Committee who said, "We are here today to speak out against last night’s U.S. military attacks on Syria. We denounce Trump’s fake moral outrage and call this attack what it is: a pretext for more war. Trump claims to be defending civilian lives in Syria while banning Syrian refugees from entering the U.S. with his racist Muslim ban and ordering missile strikes on the most heavily populated part of the country." The Minnesota Peace Action Coalition initiated planning and the protest was endorsed by a range of organizations.